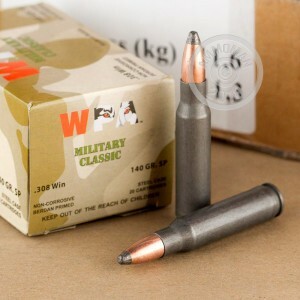 This .308 Winchester ammo from Wolf is made in Russia and delivers cost-effective performance for both hunting and target shooting applications. Each cartridge fires a light 140 grain soft point bullet that delivers strong expansion to bring down deer and other animals quickly. 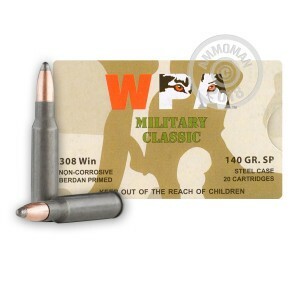 These cartridges use non-corrosive Berdan primers and non-reloadable steel cases. Steel is abundant and inexpensive to get in Russia, an advantage which contributes significantly to the lower price of this ammo. 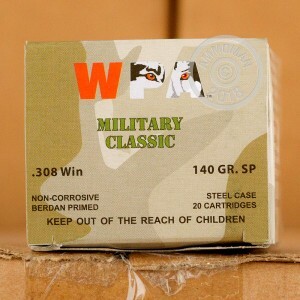 Buy this 500 round case at AmmoMan.com (or any other item over $99) and get free shipping! No gimmicks or nasty double-digit surprises at checkout. 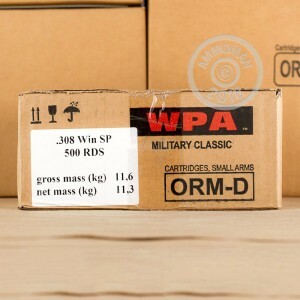 I bought this ammo as surplus ammo for target shooting for my PTR-91 and C308. What I've shot so far has run flawlessly. While this isn't "match grade" ammunition, its reasonably good quality. For no other reason than 'they say it's no good' I never tried any Russian ammo until recently. What a joke that info is this is all I'm shooting now including my whitetail loads coming this fall. I have destroyed hogs where they stand up to 232 yards range verified. There was no heart to identify it was simply eviscerated. Sure if I were in a match needing calipers to decide the winner I'd buy Hornady, but I'm not. The accuracy is only slightly less than the most expensive round I can put in the chamber. Not one single issue with almost 300 rounds down range I'm done wasting money on expensive brass. I don't know the age of the firearm you are using to fire that Wolf ammo with but you may want to look into a weakened firing pin spring or even a worn firing pin. I have fired this caliber of Wolf ammo through several firearms that are all fairly "newish" and have had ZERO problems as far as the primers go, being "too hard" or what have you. You could even have a headspace problem. I would allow a gunsmith to do a quick once over of your firearm just to make sure it isn't your gun giving you the problem rather than the ammo. But in everything from a VERY inexpensive Mossberg rifle to a PTR91 I have had no problems and that doesn't include about 4 other rifles I have fired this Russian made ammo through. Check your gun before it completely fails you in the field is something I highly recommend to you. I also have several friends that use this ammo (they are all cheapskates like me), and none of them have mentioned a single problem either. Please have your firearm checked. Heck, it could be something as simple as some fouling not allowing your firing pin its full travel. Could be a lot of different things. I used this lighter than I normally use weight bullet on a large Whitetail I harvested on my own property and dropped him where he stood. When dressing the animal the internal damage was massive with both lungs blown and the entire top part of the animals heart simply "burgered". Why on earth anyone would pay more for a round that produces this much damage is beyond me. I did have some concerns on how a soft point load might feed in my PTR91 but I had no failure to functions when zeroing the ammo and none when hunting and if it will feed through a PTR91 it will surely put a smile on the face of a bolt gun user. Great round, great price. Loaded very consistently and is a clean burning and highly accurate round that I highly recommend to any and everyone. Shoot more, pay less and feel VERY secure when using it as a hunting round. The ammo also burns just as cleanly as any American made round. Wolf has made a LOT of advances since it was first introduced into this country and is now at least the equal of its MUCH, MUCH more expensive American made competition. Perfect ammo that give perfect results. One question alone concerns me and that is how on earth Ammoman can get a ground order to me from their location to Western Wisconsin in 3 days. On another shipment of different ammo it was only 2 days. Amazing delivery times from Ammoman!!! bad lot of primers with this ammo. This ammo was for my wife's new rifle. Unfortunately so far there have been a lot of misfires. I've checked each round that misfired and the firing pin is denting the primers the rounds are just not firing. Apparently we've run in to a bad lot of primers in this batch. I've had good luck with Wolf in the past with my 5.56/.223 ammo. This lot just hasn't been up to speed.